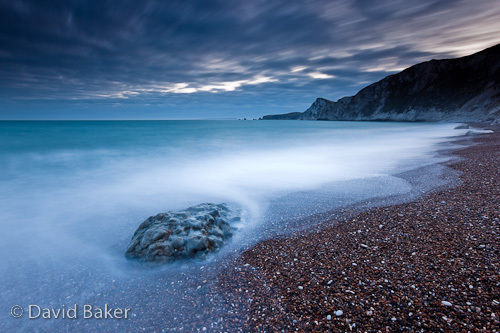 Yet another from Monday evenings shoot at Worbarrow Bay, this time with a standard 3 stop ND Lee Pro Glass filter to slow the waters movement around the jurassic rock lying on the beach and again adding a touch of movement to the clouds. Its a great location and a really pleasure to get access to this location, in a later post I’ll cover some of the history behind Worbarrow Bay but for now its time for me to settle down in front of the TV to scream and shout Man Utd to a victory against Bayern Munich in the Champions League……Come on ROONEY! ~ by David Baker on 7 April, 2010.